Marineau: "The model with Android is one of microforking"
Google's problem with Android is both the Linux and Java components it's built with and the way it's implemented by multiple handset makers. That's according to Sebastien Marineau, the senior vice president of BlackBerry OS. TechRadar at the BlackBerry Jam conference. That causes security headaches and ultimately limits what Android can do. "I call it architectural integrity; maintaining integrity of the architecture and for that you need to deeply understand that architecture. The model with Android is one of microforking, from handset manufacturer to handset manufacturer and even between handsets." 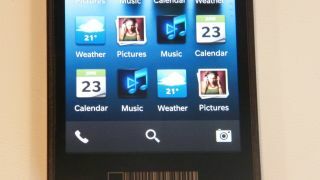 BlackBerry 10 and QNX partition what different apps and processes are allowed to do very strictly, but the design of Android is quite different. "It's much harder to partition in Android because it's a distributed architecture. It's a distributed object model throughout all the Java components and processes and it's far more difficult to partition that." Plus there is a lot of Android to understand, compared to the small but powerful QNX kernel that powers PlayBook and BlackBerry 10. "If you look at the microkernel architecture, the microkernel is the only trusted component in the system," he explains. "It's the one thing that can never fail and it gets to control access." "In the case of our microkernel it's about 100,000 lines of code, give or take ten thousand and that's the core code that has to be absolutely bullet proof. If you look at something like Linux, I don't know what it's up to today but it was up to 14 million lines six months ago. That code all runs in privileged space and one line in that can take down the whole system or be the vulnerability that people exploit. It's very difficult to test to prove that that amount of code is secure and bug free." But the QNX kernel is very stable and the QNX team knows it inside out. "We didn't rewrite the QNX operating system for BB10," he points out. "We took that platform and we took the operating system and we're building an entirely new mobile stack on top of it but the core of it, QNX, has stood the test of time. The version we're building on first released in 1999 to 2000. When you look at the heart of an operating system it usually takes a decade to mature." Do we really care how secure or efficient our phones are providing we can get online and play games? We will, Marineau predicts. "A day of reckoning will come. Because as more and more of our lives migrate from desktops and laptops to mobile devices, we will have to solve the problems around security, privacy, anonymity, access to data. If we want this true seamlessness between devices, it means that the underlying plumbing has to share all this data and the only way to do it is going to be to actually solve these hard problems. I am sure there will be some spectacular security breaches - and then people will wake up." Better security is just one of the advantages from QNX, Marineau believes. Not having an LTE phone this year really hurt BlackBerry sales but as he points out, "LTE devices today have really poor battery life." It's an area where he thinks BlackBerry 10 can shine with the way it squeezes out more battery life by using the efficient connection to the RIM network for saving power when you're getting email or social network updates. "When you use services like Facebook and Twitter they're typically polled services. We can turn them into push or do clever things in how we align all these services and when they're polling in order to save battery life." Plus LTE phones today only work in one country. "The challenge of LTE is there are so many bands and every country is different. The complexity of building an LTE world phone is huge." But in a few years' time, RIM will have software switched antennas (developed by a company it bought called Paratech) that could work with all the different LTE frequencies around the world, so RIM could make a single phone and sell it everywhere – or you could take your UK LTE phone and use in the US when you travel. Plus the OS and even apps could behave differently depending on how you're connected and where you are. That's something Marineau says the Android architecture won't support. "It's one of the benefits of actually owning the stack. You're basically able to change anything in the stack to globally optimise when you have a hard problem to solve, which is something that iOS can do but Android is limited in what they can change. "They can't really change Linux that much; and they get standard drivers from vendors and it's difficult for them to change them. If you look at where they're innovating, they're innovating in the Java layer at the top but they're constrained in what they can do lower down the stack."